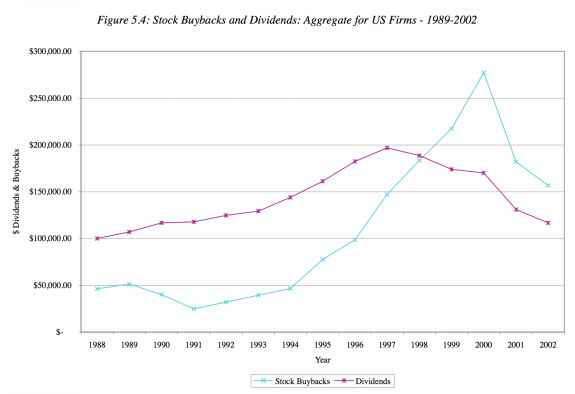 One reason for the fall of the dividend discount model from favor has been the increased used of stock buybacks as a way of returning cash to stockholders. A simple response to this trend is to expand the definition of dividends to include stock buybacks and to value stocks based on this composite number. 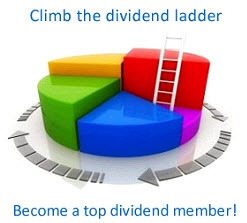 In this section, we will consider the possibilities and limitations of this expanded dividend discount model and also examine whether the dividend discount model can be used to value entire markets or sectors. In recent years, firms in the United States have increasingly turned to stock buybacks as a way of returning cash to stockholders. Figure 5.4 presents the cumulative amounts paid out by firms in the form of dividends and stock buybacks from 1989 to 2002. The trend towards stock buybacks is very strong, especially in the 1990s. By early 2000, more cash was being returned to stockholders in stock buybacks than in conventional dividends. Modified growth rate = (1 - Modified payout ratio) * Return on equity Even the return on equity can be affected by stock buybacks. Since the book value of equity is reduced by the market value of equity bought back, a firm that buys backs stock can reduce its book equity (and increase its return on equity) dramatically. If we use this return on equity as a measure of the marginal return on equity (on new investments), we will overstate the value of a firm. Adding back stock buybacks in recent year to the book equity and re-estimating the return on equity can sometimes yield a more reasonable estimate of the return on equity on investments. In November 2005, Exxon Mobil was the largest market cap company in the world. With the surge in cash flows generated by rising oil prices over the previous four years, Exxon had augmented dividends with stock buybacks each year. Table 5.3 summarizes the dividends and buybacks between 2001 and 2004.